Enrique has announced that he is about to leave after this season is over, about his successor, opinions are widely divided. According to the Spanish Media, CCMA’s reported, Barca has got in touch with the former Paris’s coach Blanc, this coach has a big possibility to coach in next season. Enrique has won the treble in his first season, and brought the champions of La Liga and King’s Football Cup in the second season, but in this season, Barca’s record has slumped under his lead, team has been kicked UEFA Champions League out, legging behind Real Madrid on La Liga, winning to champion only stay in the theory, Barca may be possible to end with a champion of King’s Football Cup in this season. Enrique has signed with Barca for 3 years, some time ago, he announced his leaving over this season. After that, about his successor, Valverda,Wenser, Sampaoli and Allegri, all of them has been contacted with Barca. Recently, Spanish Meida ,CCMA said that, among those candidates, the former Paris’s coach Blanc has been listed on the top. According to this media, Barca’s top has meet Blanc, both side has communicated with the possibility of coaching. Blanc is an excellent center back in his player times, and he won the 1998 FIFA World Cup’s champion, after retiring Blanc coached 172 matches in Paris, 126 wins, 31drwas, 15 defeats, won 3 champions of Ligue 1 continually , 3 League champions, 2 champions of Coue de France, even won Champion's Trophy’s 3 champions continually. 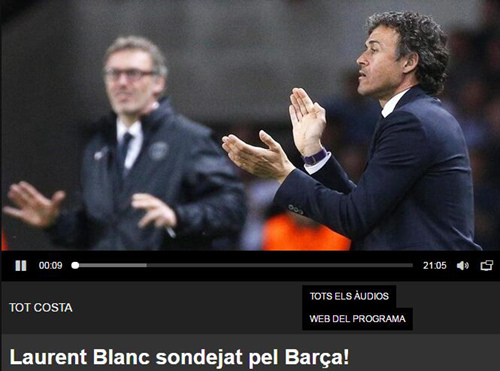 It’s worthy to say that Blanc has coached for 1 year in the 1996-1997, he is not stranger with Barca.